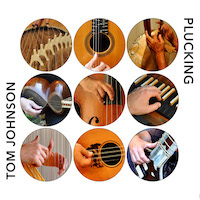 “Plucking.” Tom JOHNSON: Selections from Rational Melodies (1982); Plucking (2015); Failing: A Very Difficult Piece for Solo Bass (1975)*; Doublings for Double Bass (1980)*. Just Strings: Ric Alviso (kora), Alison Bjorkedal (hrp), Eric Ederer (oud), Paul Livingstone (sitar), Kozue Matsumoto (koto), Tom Peters* (cbs), Pirayeh Pourafar (tar), John Schneider (guit), Richard Valitutto (hpsi). MicroFest Records MF9 (1 CD) (http://www.microfestrecords.com/). The title piece is the disc’s anchor, requiring nine plucked string instruments. To fill out this release, each member of the nonet takes a crack at one of the many Rational Melodies, and the bassist, Tom Peters, steps forward with two solos. For this release, the players employ variants of just intonation; most use some form of five-limit tuning. The particular Melody each musician chooses fits well, as if Johnson were after something ethnic all along. For the record, these are the selections (and instruments): 13 (harp), 18 (koto), 1 (kora), 15 (sitar), 3 (tar), 12 (harpsichord), 2 (oud), 10 (guitar), 4 (bass). Plucking introduces the nine gradually, completing a grid governed by mathematical patterns. Timbres shift as players emerge and retreat. A soloist may remain with just one or two pitches, and then the fabric builds again. Sometimes the canons and rhythmic changes become evident, but mostly the piece entrances and puzzles. If you don’t know Failing, then you are missing out on a classic for a speaking bassist. I won’t give away details, except to say that Peters must describe the piece as he’s performing. Doublings demands that the soloist elaborate upon a pattern which expands geometrically and recursively. The soloist is required to perform from memory and when the lengthening series becomes unwieldy and he loses his way, the piece stops. 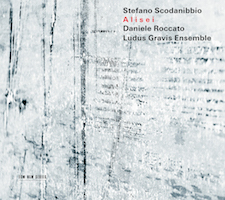 Salvatore SCIARRINO: Ai limiti della notte (1979)*; Sei capricci (1976); Capriccio di una corda (2009); Tre notturni brillanti (1974-75)*; Fra sé (2009); Per Mattia (1975). Marco Fusi (vln, vla*). Stradivarius STR 37057 (1 CD) (http://www.stradivarius.it/). Bring on the Sciarrino, especially if there are firsts in the batch. 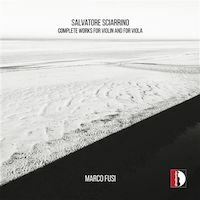 Fusi charts a singular approach to the early solo works, probing for purity and beauty, when others may relish the coarseness. I might prefer, perhaps, Carolin Widmann’s gritty Capricci (Hänssler Profil PH14036). However, there are plenty enough grinding harmonics and white noise bursts, Paganinian vapors sensed among dense smoke. It’s evident that there are two periods here: the tentative quivering, scratching pieces from the ’70s, and the two recent plaintive, melodic works with curvaceous, slurping glissandos. I keep coming back to Capriccio di una corda and Fra sé, both marked as first recordings. Fra sé haunts as it searches plaintively with its dipping, sliding melody. “Alisei.” Stefano SCODANIBBIO: Alisei (1986)1; Ottetto (2011)2; Due pezzi brillianti (1985)3; Da una certa nebbia (2002)4. Daniele Roccato1,3,4, Giacomo Piermatti4 (cbs), Ludus Gravis2: Daniele Roccato, Francesco Platoni, Giacomo Piermatti, Alessando Schillaci, Andrea Passini, Simone Masina, Stefano Battaglia, Paolo Di Gironimo (cbs), Tonino Battista (cond.). ECM 2598 (1 CD) (http://www.ecmrecords.com/). It’s often difficult to determine how many are playing in Scodanibbio’s innovative creations. Alisei is a mysterious solo requiring double stopping, trilling, harmonics and resonance, and sounds like the instrument is accompanying itself with an ensemble of at least one or two. The Two Pieces are more clearly solos, but there are enormous leaps which mimic conversing voices. Da una certa nebbia is a duo (“for double bass and another double bass”) where the second player hovers in the background quietly holding pitches and offering subtle pizzicati. Roccato recounts Ottetto’s creation. Succumbing to ALS, Scodanibbio envisioned an octet containing every technique in his toolbox. Roccato worked with Scodanibbio to map out the 30 minutes (colors and techniques came before pitch material) which were completed in 2011. Imagine clouds passing over a fertile landscape, as the ensemble groans and clicks. The solos are very present and dynamically recorded, whereas Ottetto proceeds as if at a distance. 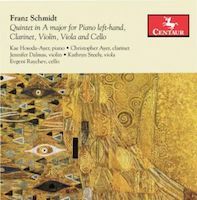 Franz SCHMIDT: Quintet for Piano Left-hand, Clarinet, Violin, Viola and Cello (1938). Kae Hosada-Ayer (pno), Chrisopher Ayer (clar), Jennifer Dalmas (vln), Kathryn Steely (vla), Evgeni Raychev (vlc). Centaur Records CRC 3472 (1 CD) (http://www.centaurrecords.com/). Absent right-hand anchoring and the repetition of hefty chords, Schmidt’s Romantic Quintet is unexpectedly transparent for a grand, five-movement 69-minute opus. The ensemble also approaches it with delicacy, clarinet finely balanced with strings. The Scherzo becomes a moto perpetuo of swirling filigree as all instruments circle in a high tessitura. Written for Paul Wittgenstein, like much of the piano left-hand repertoire of the day, there are ample places for the single-handed player to shine, such as in the solo Intermezzo, and the intro to the Adagio. Wittgenstein’s principal teacher was Josef Labor, and this quintet’s Finale is a theme and variations on material from the blind composer and organist’s 1900 Piano Quintet, Op. 11. There is a two-handed version of this Quintet, but Hosada-Ayer takes all the notes with left hand as intended. “Hungarian Treasures.” Ernst von DOHNÁNYI: Piano Quartet in F-sharp minor (1891-93). Zoltán KODÁLY: Intermezzo for String Trio (1905). Béla BARTÓK: Piano Quartet in C minor, Op. 20 (1898). Notos Quartett: Sindri Lederer (vln), Andrea Burger (vla), Philip Graham (vlc), Antonia Köster (pno). Sony Music 88985411882 (1 CD) (http://www.sonyclassical.de/). These three Hungarians were young when they wrote these works: Dohnányi (1877-1960) and Bartók (1881-1945) were in their late teens, and Kodály (1882-1967) was in his early twenties. Perhaps because Kodály was older, his miniature sounds poised to move forward whereas Dohnányi and Bartók were trying to establish connections with the past. It should not surprise that Dohnányi’s Piano Quartet steps out from Brahms and Dvořák with a rolling piano part and expressive melodies. The first movement is the most substantial, then a quick Adagio and a sprightly Scherzo-Trio follow. The reliance upon arpeggios and scales in the Finale amounts to weak filler. The Kodály Intermezzo for violin, viola and cello is over and done in just five-and-a-half minutes, immediately establishing a folksy mood with chromaticism and personality. Bartók’s Piano Quartet is the big draw. This is the first recording of a piece that had gone missing (the notes don’t detail where it had been hiding). We meet a Romantic firebrand, infatuated with the bluster of Franck or early Brahms. There’s much energy, a few memorable gestures, but not a lot of development. It is remarkable that a slightly later, but still early Bartók composition, the 1904 Rhapsody for Piano and Orchestra, Op. 1, could sound like Liszt and be so different from this Quartet. Bartók had three series of opus numbers: A first list climbed to Op. 31, a second series begun in 1894 halted at Op. 21 in 1898, and a third list started in 1904 with the Rhapsody, but stopped for good with Op. 21 in 1921. 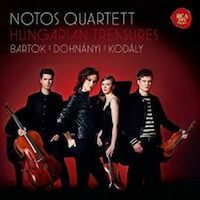 This Quartet does not sound like the Bartók we know, but then again, the Dohnányi would also be hard to place. Gyula CSAPÓ: Déja? Kojâ? (2011-16). Quatuor Bozzini: Clemens Merkel, Alissa Cheung (vln), Stéphanie Bozzini (vla), Isabelle Bozzini (vlc). 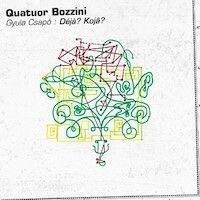 Collection QB CQB 1821 (1 CD) (http://www.quatuorbozzini.ca/). Csapó’s mammoth three-part quartet yields gradually. The three parts (28:28, 22:05 and 22:48) combine into 73:21. Its French and Persian title means “Already? Where to?” This contemplative work, a treacherous fusion of Scelsi and Feldman, sounds awkward and uncomfortable. Held notes create dissonant fields that are sprinkled with pizzicato and silence. Déja? Kojâ? moves forward and back at its own logic, repeating motives and notes, making slow indirect progress like a beetle struggling to crawl over a pencil. The precise details and rhythms require immense ensemble coordination. The widely spaced dissonant chords are not pretty. When multi-octave glissandos appear they do not surprise. There are aleatoric passages in Part Two where the violins play harmonics but must stop when the viola and cello pluck notes. The pulse slows drastically for Part Three. A listener must be in the right frame of mind to penetrate the work. I approached it several times, but it didn’t reveal itself until perhaps the fourth or fifth time. 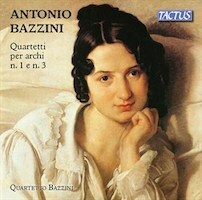 Antonio BAZZINI: Quartetto No. 1 (1864); Quartetto No. 3, Op. 76 (1879). Quartetto Bazzini: Lino Megni, Daniela Sangalli (vln), Marta Pizio (vla), Fausto Solci (vlc). Tactus TC 810202 (1 CD) (http://www.tactus.it/). Bazzini (1818-1897) may be best known today for his violin showpiece, Dance of the Goblins (1852). A precocious violinist, as he matured he came to the attention of Paganini, Schumann and Mendelssohn. Eventually settling in Milan, Bazzini taught composition at the Conservatory and became its director. Given the ensemble’s name, and that there are six string quartets, this may start a series. There is a maturity gap between Nos. 1 and 3: The First quartet shows confident instrumental balance but lacks No. 3’s personality. Nonetheless they are less weighty than any of their Germanic counterparts, and on a program with Schubert or Brahms they would sound wearying. No. 3 charms rather than impresses. The Minuetto’s development and the Finale’s coda suggest directions that are never realized. It may be unfair to contrast with Verdi’s 1873 contribution to the genre, occasionally awkward but much more emotive.